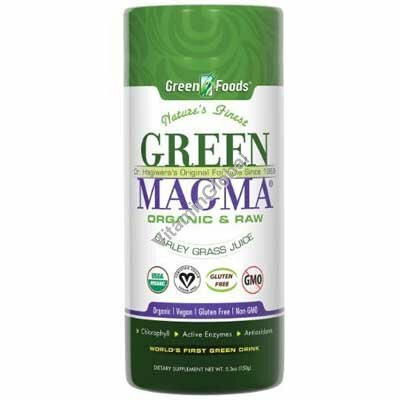 Green Magma - Powdered Barley Grass Juice 150g (5.3 oz) "Green Foods"
Green Magma - Powdered Barley Grass Juice Dietary Supplement Containing Active Enzymes, Antioxidants, Vitamins, Minerals, Amino Acids, Protein, and Chlorophyll. Dr. Hagiwara's GREEN MAGMA® is a very nutritious, mildly alkaline powder made from organic young barley grass juice. Young barley grass contains perhaps the most balanced nutrient profile of all green plants with an abundance of vitamins, minerals, antioxidants, amino acids, proteins, active enzymes, and chlorophyll. Daily consumption of Green Magma® will help provide your body with essential nutrients that promote the health and vitality of the entire body. After taking Green Magma daily for as little as 1 week, many people have reported feeling a dramatic increase in energy, better looking hair, skin, and nails, and increased regularity - all signs of good nutrition. Powdered juice from organically-grown* young barley grass, maltodextrin (a complex carbohydrate), brown rice. * Certified organically grown and processed in accordance with the California Organic Foods Act of 1990. Dissolve 2 teaspoons into an 8 oz. glass of water or your favorite juice. Do not take with hot liquids since heat will neutralize active enzymes. Recommended once or twice daily on an empty stomach (20 minutes before a meal). Keep tightly closed after opening and store in a cool, dry place.